McCarthy, Reynolds, & Penn, LLC is located in Columbia, South Carolina and routinely represents clients throughout the state as well as clients outside of South Carolina. The Firm primarily focuses its practice on the representation of business clients in non-bankruptcy workouts and bankruptcies. 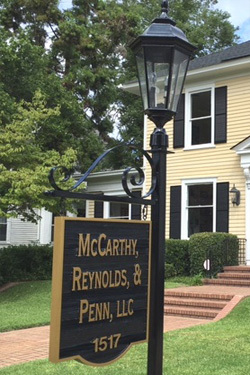 The law firm of McCarthy, Reynolds, & Penn is located in the central business district of downtown Columbia at 1517 Laurel Street in one of Columbia’s historic homes. The home was renovated in 2012 in order to meet the needs of today’s clients, with modern law office technology, while still maintaining its historic charm.